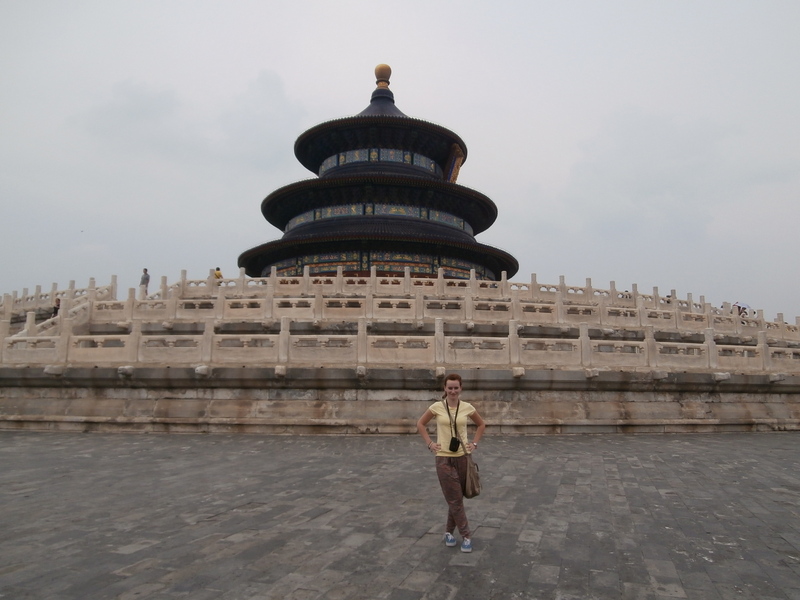 Tuesday: After a little recuperation from arriving on Monday, me and the group from the hostel decided to venture to the Temple of Heaven. Chinese tourists flocked to the place, meeting just a handful of Westerners there. It was a lovely walk around the Temples, although looking rather similar to each other. The park surrounding the temples were lovely, trees lined together which made the park seem calm. The tourists put a stop to that however. To me, I felt that the park had become to feel like a tourist attraction, with no real atmosphere to it. Then we went and got food. My first experience of dumplings were not great. They were filled with pork, I’m not too keen on pork, but the dumplings taste very strongly of it so I didn’t eat many of them. After that we headed to the Silk Market. It was nothing like I expected. I was expecting a real old traditional outdoor market, selling fish, meat and vegetables. I was really impressed. 4/5 floors filled with everything you could think of; clothes, sunglasses, purses, suitcases, electronics, shoes… Each floor dealt with specific items, with each shop delegated an area for shopping. Wednesday: We had to get a bus from our hostel to pick us up and head to a campus on the outskirts of Beijing. An hour out from Beijing, we literally turned into an industrial site. The campus itself was lovely, where we got food and had a couple of drinks that night. I decided to hit the bed early because we had a busy day tomorrow. Thursday: We packed up and left for Harbin. Taking a train, it took 8 hours to reach it, arriving at 10pm. What I found cool was that every shop had neon lights advertising them in the city. I really like the city itself; to me it reminds me of Paris. The buildings have that Parisian look to them. Also the streets are wide and long. Its considerably colder than Beijing, but it’s not too hot so it is perfect weather. Friday: Stayed in our hotel which will be home for a week. At 1 we got picked up and got driven down to the Harbin University. This is where we will be doing our TEFL weekend course, and our other actiivites, such as as calligraphy, learning Mandarin and doing Tai-Chi. Saturday: Started our TEFL weekend course… Our teacher was lovely, talking to us about things like jobs after the internship and what we should expect in the classroom. We had to practice teaching, where three of my group had to make up a 5 min lesson with a lesson plan he gave us. It wasn’t an evaluation, it was really just to do get us used to what we will be doing next week. I expected it be like a test, where he would mark us up on any bad things we done, but thankfully nothing like that happened, just giving constructive criticism for next time which is great to hear! Sunday: My second day of the weekend course. This time we had to do it in pairs, where me and another girl called Jayne had to teach a 5 min lesson about ‘I like/I don’t like’ to elementary level. I was a little nervous, so what am I going to be like have to teach something for a whole hour! Hopefully It will be grand, and as I say, everyone is in the same boat as me so I’m not the only one starting something new next week. Monday: Today we had the day off, so me and another couple of people decided to venture to the main shopping street in Harbin. It’s a lovely area. Eveywhere is so clean compared to where we are based. We visited a Russian church and then headed down to the river and walked along there for about an hour. It’s a beautiful area, where we saw elderly people dancing and men playing some kind of Chinese chess. All the elderly seem to have such a better lifestyle compared to home. I see them constantly out and about, and from what I see, enjoying life. Tuesday: it was back to the campus at 8am. Today we had Mandarin class and Tai Chi. I enjoyed the Mandarin; I feel a lot more confident in saying hello and goodbye, because a lot of emphasis is put on the intonation of the word. I also got my Chinese name!…. aÌ lÍng . Its similar to my actual name but I think it’s cool. We got off early so we headed back to the campus. Later we headed to a restaurant where we got lovely food. All for about 140yen. Being 8 of us, we only had to pay about €4 each for 5 dishes full of food! A large beer is only 4yen… 80cent! I’ve also become obsessed with Lays and another type of Chinese crisps… I feel so hungry after I eat food… literally about an hour after I’ve ate, I want to buy crisps to fill myself. I’ve also literally become a vegetarian… everything here is so fatty… fat is on every bit of meat. I’m not a picky eater… but that’s is just one thing I can’t stand.. I haven’t had any meat in days, living off rice from the campus and crisps from the shop down the road. Have so much to tell about China I will blog about them on my next posts! Finally I’ve made it to China! Staying at the Happy Dragon Hostel which is fine, the employees are lovely, helping us bring in our gigantic bags from the taxi, and generally being friendly and outgoing towards us. I’m staying with 4 other girls from the internship so I’m getting to know them!. So tonight is a quiet night, I’m so tired and jet-lagged It will be an early night, hopefully we (the ones who arrived today) will be more sociable tomorrow night! Might go and see if we can find a place to eat, really want to try those dumplings, although apprehensive because of the large variety, aka insects, dog, cat… I could end up eating. We also went to see Tiananmen Square. Although impressive, it was very busy, meaning we couldn’t truly appreciate it to the max. We weren’t sure if we had to pay to go further in, but maybe we will go and visit it again. Everyone in the group seems to be bonding… of course many are closer because they arrived earlier in the week, but everyone I met so far seems friendly. There are more people to arrive during the coming days, another couple of Irish people arriving too which will be good! Not sure what is planned for tomorrow. A good night sleep will do the world of good. Wasn’t in great form to do much because I was just so tired. Tomorrow will be a better day. Oh also Beijing is HOT. I knew it would be hot… but its sticky, humid and being surrounded by millions of people makes it 10 times worse to actually walk around the city. Roll on tomorrow and see what it brings.